Students who are placed in small groups with others who are reading at the same level are able to receive individualized quality instruction that helps them to grow as readers. In addition, it allows the instructor to tailor lessons to the specific group. In order for students to be successful, they need to understand where they are and where they need to be. Schools that frequently educate students and their families about how they are doing are seeing success. In addition, many schools utilize data walls in classrooms, so students can track their own progress. Schools showing large gains in reading scores tell us that they celebrate the success of their students. Children who move up reading levels are rewarded for their effort, giving them a sense of ownership and pride. Schools that have support from their entire staff, including administrators, teachers, OST providers, and community volunteers around a school-wide reading strategy are able to create an environment conducive to reading instruction and move reading scores forward. It is important to engage with families around their children’s reading growth by providing families with information about where their children are and where they need to be. In addition, many schools give families tools to use at home to help their children progress and provide resources that can help families improve their own reading skills as well. 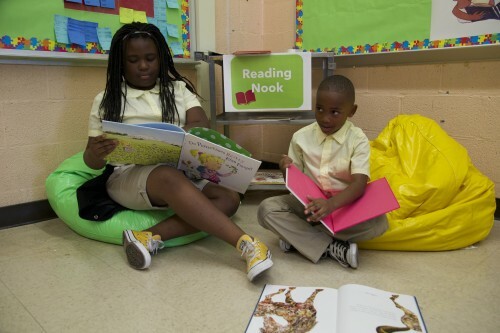 Schools that encourage daily reading over the summer are able to combat summer learning loss, ensuring kids are on track and ready to pick up where they left off when school starts.